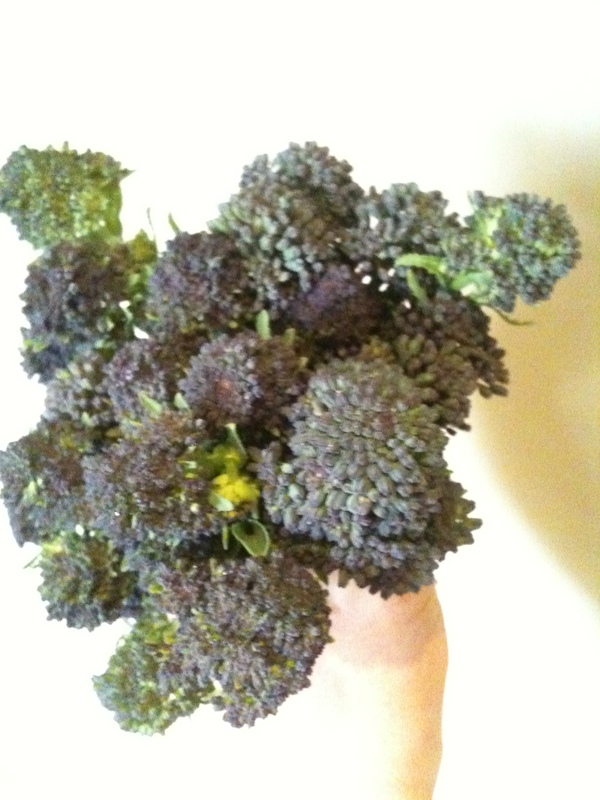 One of three bunches of purple sprouting broccoli that I blanched and froze during the week. The rest is all going to seed which I hope to collect. I’d plant this broccoli again anytime. 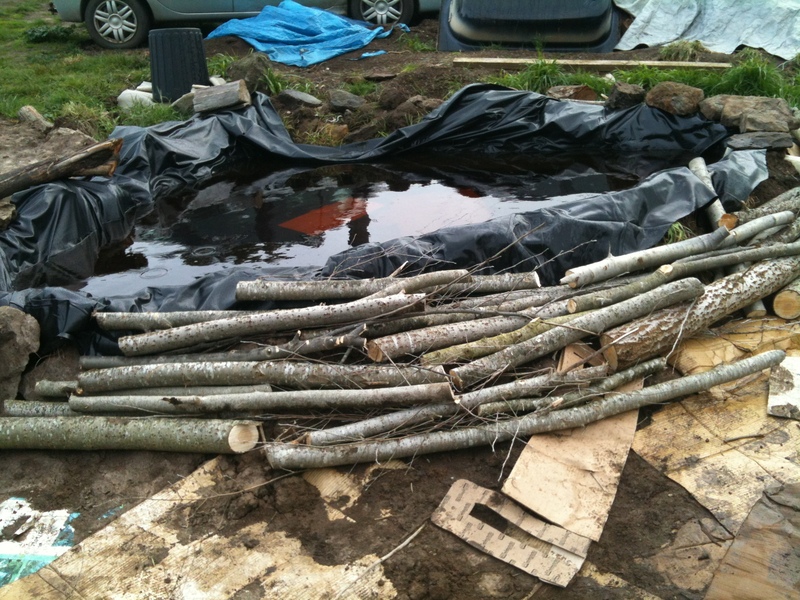 I finally found motivation and got my backside out into the garden to a) tidy up a little (not enough), b) build some hugelkultur beds and c) finish off some more of the pond. We spent the morning heading out to Newlyn where there is a lovely antiques store and heritage fruit nursery and also a water gardens nursery which was sadly closed (I will be back!) before heading home to a cold rainy and windy afternoon. Why is it that when I have motivation the weather decides to do her best to thwart me? So, armed with snow jacket, gloves and a hat I got stuck in. 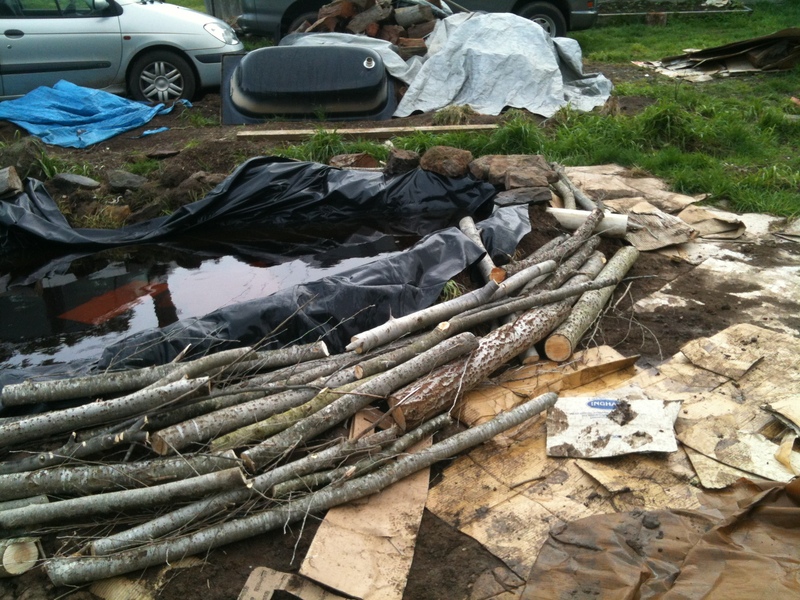 The over hang of the plastic is held in place with stones and poplar logs. 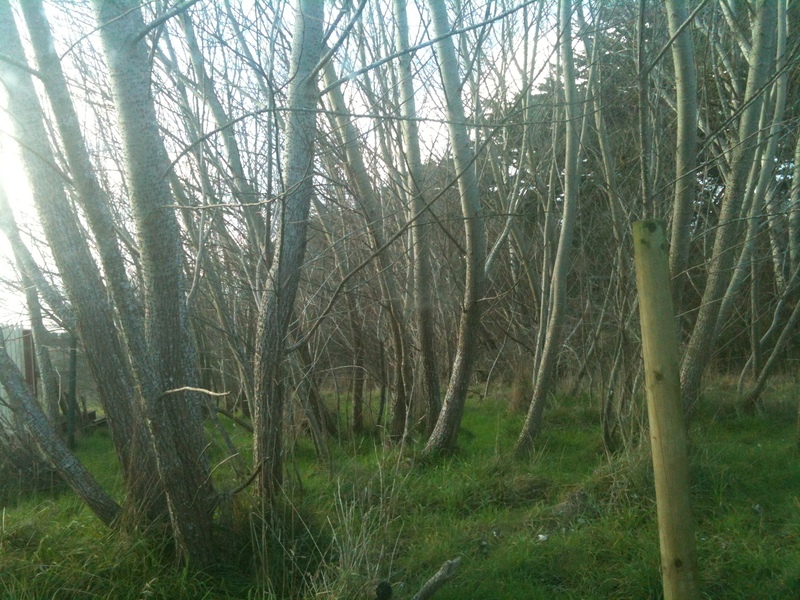 The logs will decay over time, absorbing water and attracting wonderful mycorrhizae to the soil. At first these garden beds will be lower in nitrogen as the nitrogen is used to assist in breaking down the wood, making these ideal for plants that are not nitrogen lovers. 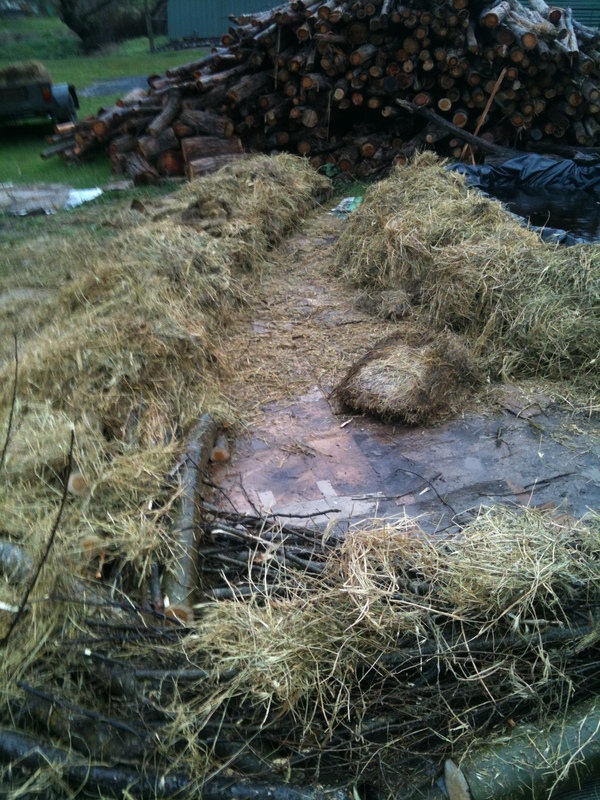 These will make wonderful beds for corn, pumpkins, zucchini, watermelons, even potatoes. 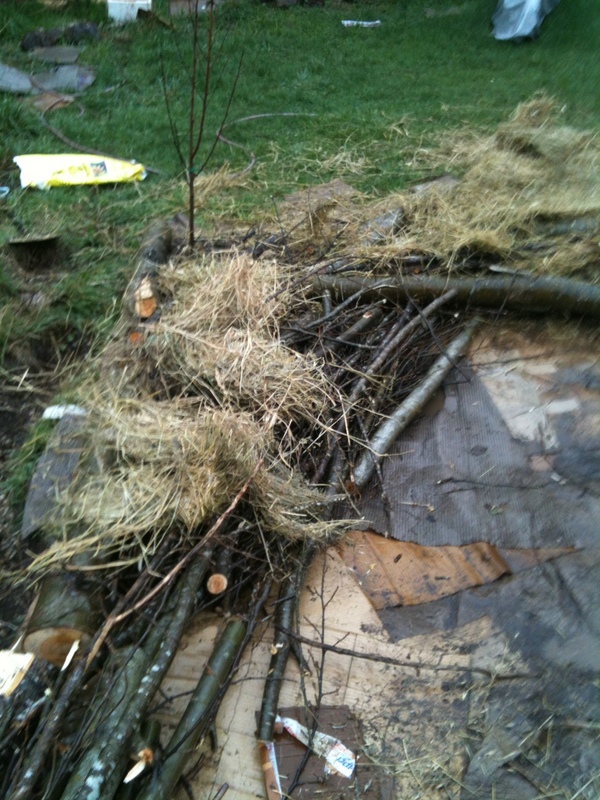 I plan to grow strawberries here as a permanent crop although I think they might be a year or two off being planted here. I need the soil structure to be improved first. 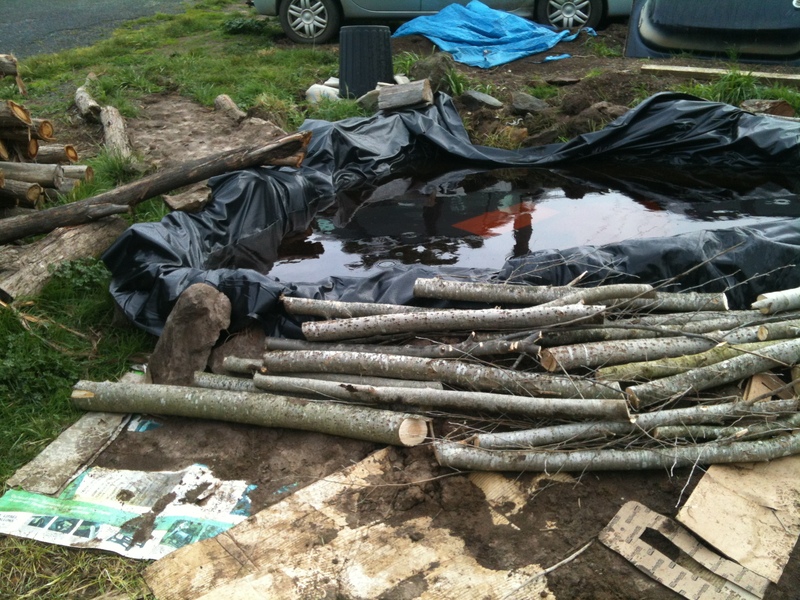 In soggy fashion (but without melting) I moved a peach tree we’d planted last year, built up the pond side hugelkultur bed and the next one too, laying down poplar branches and logs, lucerne mulch and then finally some blood and bone to help it all break down. It’s been a good afternoon. Jasper came out to help me and was a champ at breaking up the lucerne (he loved that the bales break down into the smaller biscuits of lucerne – Mummy NEVER gives him 20 biscuits ever! 😉 ) and also helping bring over branches. 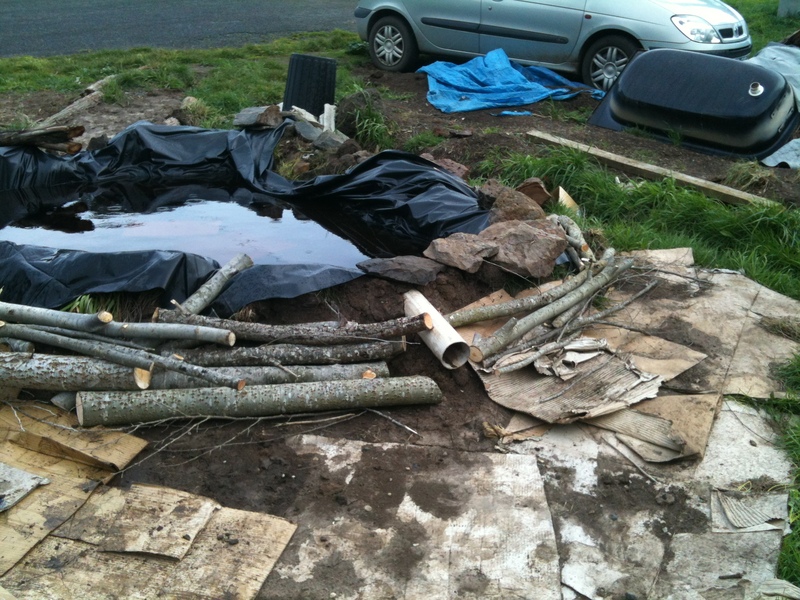 We got both beds finished too which is amazing and the rain will be washing the blood and bone down into the mulch and timber (hopefully not washing it away though), soaking into it all and getting it nice and ready for soil on top which I hope to be able to organise in the next few days. The miniature peach is on the very edge of a hugelkultur bed which means it will benefit from the nutrients and soil life in the bed but it will not be affected as the beds rot down and shrink. The peach is just in the bottom left hand corner here. The cardboard area in the middle is large enough for a small seat which will be pleasant as the peach grows a little taller and provides some shade. My little helper attacking the biscuits. 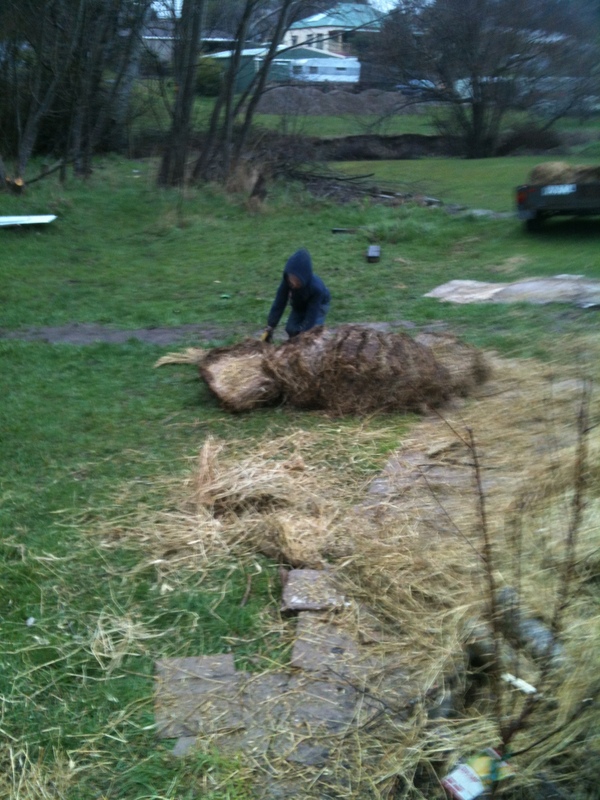 Jasper probably moved nearly 1/2 of the lucerne mulch by himself! 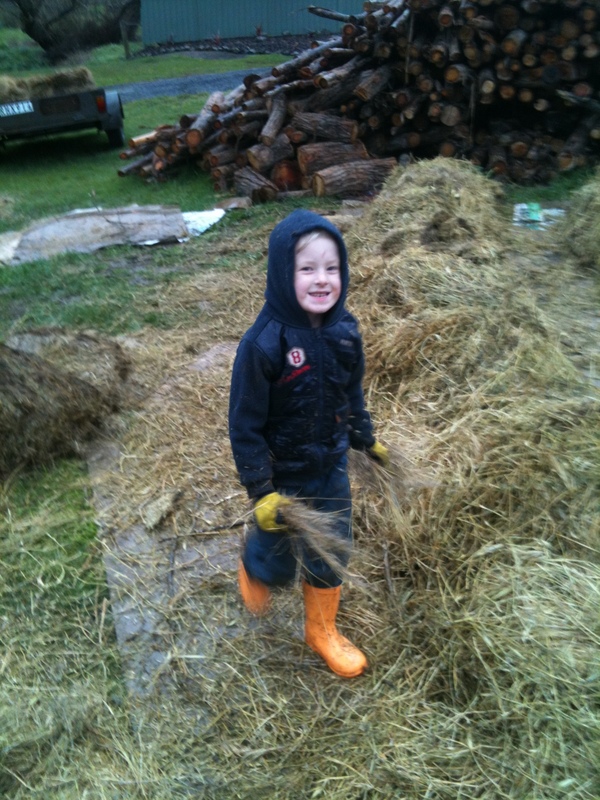 A highly efficient worker who had a blast helping Mummy out in the rain. 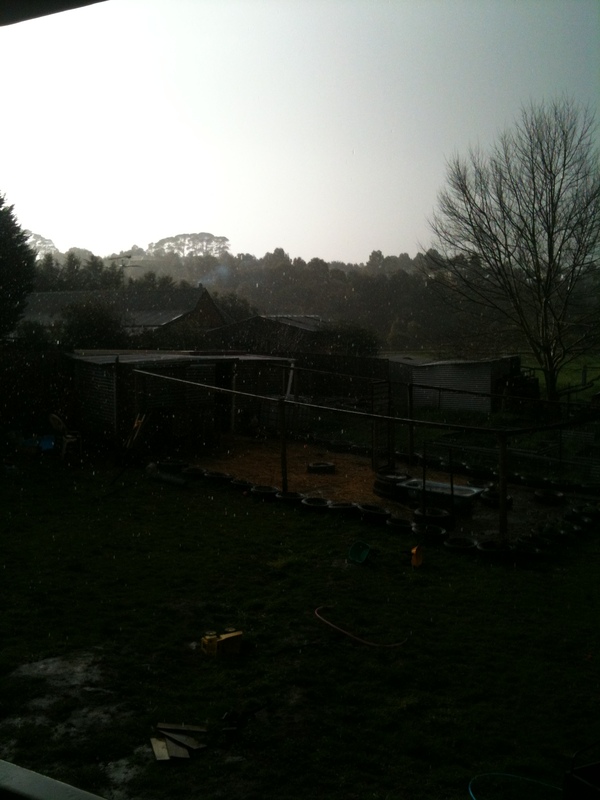 It’s hard to tell in an iPhone photo but the rain is coming down pretty heavily. 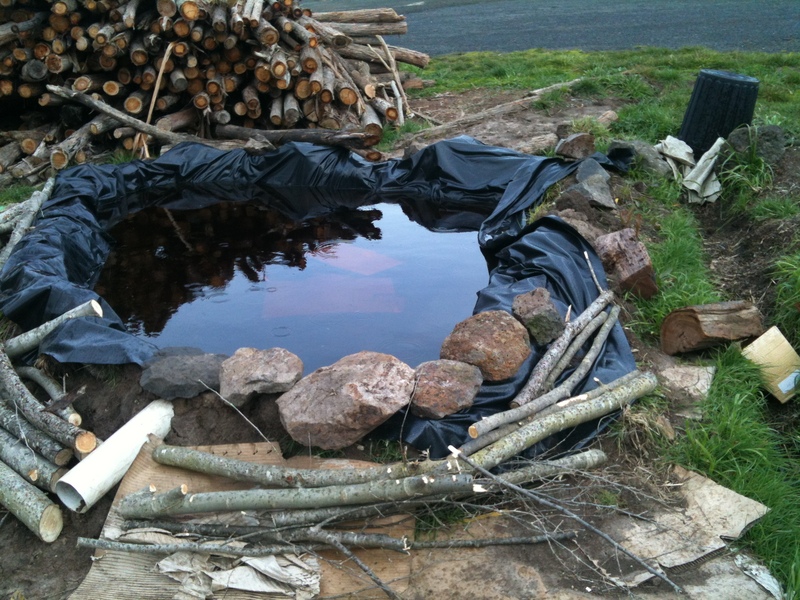 I only wish we had a water tank hooked up.